Pets friendly apartment on quiet location with private terrace and big garden. Apartment with balcony in a quiet location in the village of Deklići near Kaštelir. The apartment consists of a fully equipped kitchen, a spacious living room with a sofa bed for two additional persons, two bedrooms with double beds and a bathroom with a shower and a washing machine. The living room has a large covered terrace with seating furniture. The rental price includes the use of: air conditioning, garden, wi-fi and parking inside the enclosed yard. Pets are welcome. 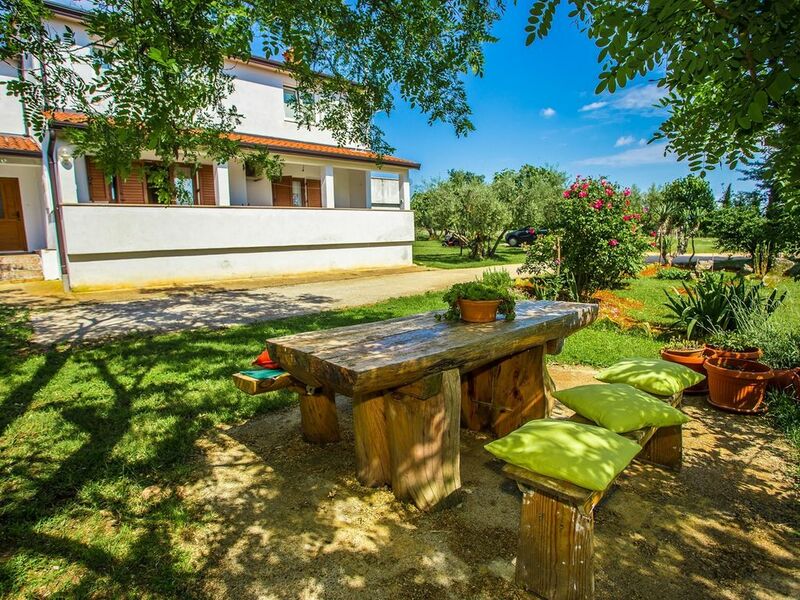 Kastelir - located on the west coast of Istria, situated only 7 km from the sea. Due to its lush vegetation that merges with olive groves, vineyards and fields it is dominated by fresh air and the smell of nature. Culture and history of this region are very interesting, Traces of the past are still visible in and around the town that is why many manifestations and events are associated with tradition. The town of Porec, a famous Croatian tourist metropolis is only 13 km way. It is a city of culture and fun, pleasant sun and warm sea, prevailed by a mild Mediterranean climate. Its trademarks are the clean and beautiful beaches and bays as well as numerous islands. The entire old town of Porec is a cultural monument. The street arrangement of the old town has preserved the Ancient Roman character. The most important historical monument of Porec is a complex of the Euphrates' Basilica from the 5th century. Book a hotel accommodation from our offer and spend a romantic holiday with your family and friends while enjoying the beauty of western Istria.